As the biggest tournament of the year, IBJJF World Championship 2014, is getting close, athletes are doing their last-minute drills fine-tuning their best escapes and submissions. The competition in women’s jiu-jitsu is tougher than ever, and last year’s victory does not make winning this year easier. The ones who strive to be better even when they are the best will prevail. The true champions must also be prepared to live with the failure. Having the courage to step on the mat knowing that there is a possibility of defeat separates them from the rest of us. Winning by advantage points is getting more and more frowns lately. Some believe that the only way to really win is to submit your opponent. Others believe that a win by points or advantages is just as valuable. Many times the competitors are so even that the referee has to decide which competitor had greater offense, and came closest to scoring a possible point. Leaving it to the referee’s hands will most likely make the loser replay the match in her head over, and over, wondering what she should or could have done. Anyone who trains knows how hard it is to submit someone who has been training as hard as you, if not more. It takes great timing, technique, and the right amount of intensity to catch your opponent. There is nothing gentle in a submission but it’s beautiful and admirable. It is exhilarating to win by submission. It is even greater if a photographer captures the exact moment when the opponent’s hand is tapping. Here are some of our favorite submission shots. We hope you like them! Third degree BJJ black belt Hannette Staack has had a busy schedule in 2013 teaching in the US and Europe. She will be closing the year with a trip to Houston for another 3-hour, women only seminar that is becoming an annual tradition. The early bird price of $40.00 is available until November 16th, after that the price is $50.00. Not only is the price of the seminar an absolute steal but the participants have a chance to win her brand new signature gi that is a collaboration between Fenom Kimonos and Hannette herself. 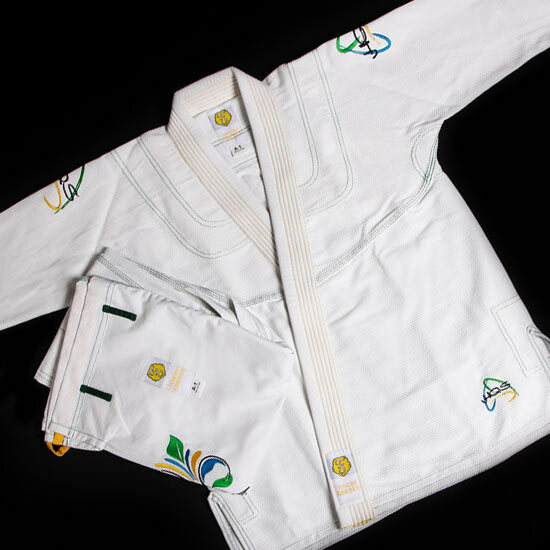 The gi features contrast stitching, inside tape, and beautiful, detailed embroidery in her favorite colors: green, yellow and blue. This is a perfect gift for someone who appreciates the subtle feminine design, and bright color scheme. To register for the seminar and private lessons, please click here. To purchase Hannette Staack signature gi, please click here. 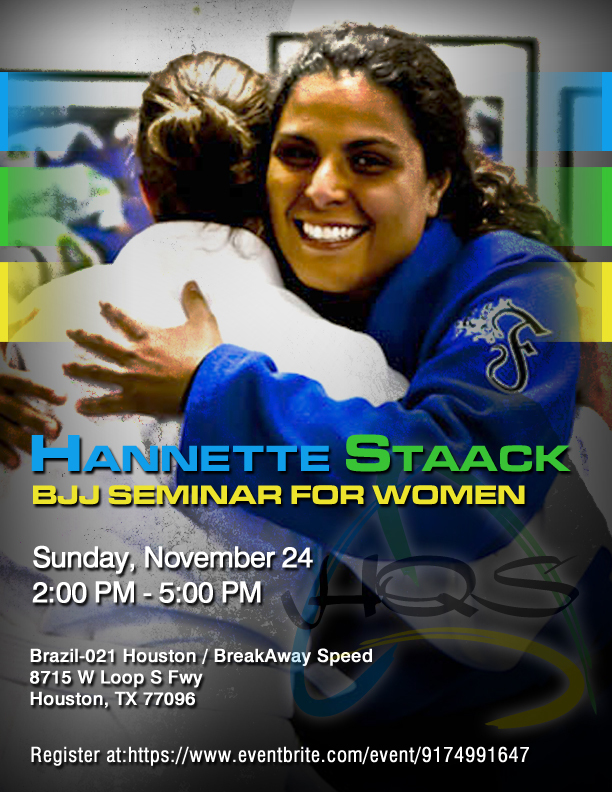 Hannette Staack is coming back to Dallas, Texas, this weekend, on August 24th, for a three-hour women’s jiu-jitsu seminar! This is the second time Fenom Kimonos is offering a free seminar with a world-class athlete and instructor to its customers. Fenom Kimonos is dedicated to offering affordable jiu-jitsu products to women and girls, promoting women’s jiu-jitsu by offering free or low-cost seminars to its customers, and supporting other non-profit initiatives that empower women. Come and catch up with old friends, meet new jiu-jitsu ladies, and spend some one-on-one time with a world champion! To register for the seminar or private lessons, or to buy a limited edition Hannette Staack t-shirt click here. To see a video from last year’s event, click here. See you all on the mat and stay Powered by She! We were inspired by a recent photo of Hannette Staack and Suay Al-Aziz. Two good friends who found each other through BJJ, one lives in Chicago, the other in Florida, spending quality BJJ time together in Brazil at BRA-021 camp and supporting Fenom! How cool is that? Do you have a friend or friends that you can’t wait to train with no matter how far they live? Do you have a friend who has matching bruises in the most odd places? Do you have a friend that comes over with a gallon of ice cream and box of tissues when you’ve had a bloody bad day on the mat? Do you have a friend who is just plain awesome? If so, here’s a chance to win a free gi or a free private lesson for you and your BFF at Hannette Staack Women’s BJJ seminar in Dallas, on August 24th! Take a picture of the two of you wearing Fenom gear* and post it on Instagram, Twitter or Facebook, or email it to info [at] fenomkimonos.com. A random winner will be picked on August 23rd. Be creative and good luck ladies! *Fenom gear = at least one of the following: Fenom gi top, gi pants, belt, rash guard, t-shirt. Fenom logo must be recognizable and visible. Women’s Grappling Camp is headed to Chicago in a few weeks! For the first time, Hannette Staack and Andre Terencio, are hosting the five-day women’s jiu-jitsu camp at their gym, Brazil-021. WGC has been around since 2009, helping women to become the best jiu-jitsu practitioners they can be. It’s a place to train with many different training partners, exchange ideas, share techniques, and life experiences. It is more than just a jiu-jitsu camp, it is an opportunity to gain tools to improve all areas of your life. To see what the instructors Valerie Worthington, Emily Kwok, and Hannette Staack had to say about the camp, click here, here and here. Our fenomenal woman for May is Kristin Mikkelson, a 24-year old blue belt to watch out for at the Worlds this year. She graduated from the University of Cincinnati with a BBA in 2010. After working in the financial sector for a couple of years, she decided to do some soul-searching and focuses on training for now. She talks about training at Brazil-021, competing, and coming back from serious injuries. Everyone meet Kristin Mikkelson! How did you find BJJ? I found BJJ after I moved to Chicago in 2011. I moved here from Cincinnati for a job, analyzing real estate funds. In Cincinnati I had trained Taekwondo for a little over 9 years, and was looking to explore a different martial art. I had seen some Brazilian jiu-jitsu before and thought it would be fun. I found some places in Chicago and decided to try a class at each of them, but as soon as I visited Brazil-021 and met Hannette Staack and Andre Terencio, that was it – I was in. Training and learning kept getting more interesting and I felt the desire to compete. Soon it was all I wanted to do! Now I train 5 days a week, some days I stay for two classes, and some days I stay for one. Do you do any other sports? Were you athletic all your life growing up? As a little kid I was only allowed to do soccer because it was the cheapest sport and my family was a soccer family. I wasn’t that good at it, nor very excited about it but my mom’s rule was that everyone in the family had to play a sport. I wanted to try independent sports like gymnastics or karate but was unable to until I turned 12 and convinced my mom to let me do taekwondo. I earned my black belt at 16 and my 2nd degree black belt with the World Taekwondo Federation when I was 19. I haven’t trained it since I started BJJ but would like to start again eventually. What does your family think of BJJ? At first my parents were a little wary of BJJ because they knew it was physically demanding, and were worried I was going to get seriously injured or ache for the rest of my life. They were also getting worried about how much I was training because they saw it taking up a lot of my time. However, now they are really supportive since they have seen how passionate I am about it. My siblings were always incredibly supportive and my little brother even started training recently back home. How often do you compete? What’s your biggest accomplishment so far? Most memorable match? Last year I did 3 competitions and this year have done 2. There would be more but my time out due to injury left me unable to compete as much as I would have liked. My biggest accomplishment so far in competition was winning my division at the 2012 Rio Open. It was my first IBJJF Gold, but the most important thing I took away was that I finally realized where my mind needed to be if I wanted to win. My most memorable matches for myself are the ones that I have lost because I always think about what little things I should have done differently. My favorite one however, was the first one I won in Rio with an armbar. Have you been seriously injured? If yes, how did you overcome the fear of coming back to the mats? Did you want to quit at any point? In August 2012, 2 weeks after I won in Rio, I broke my clavicle in 3 places. I had to get a piece removed and the rest plated, and screwed back together. I was preparing for another tournament and got swept with my arms trapped at practice. It was painful, but more so, I was a little heartbroken because it meant 6 months of absolutely no BJJ right after I had my biggest victory. I was very eager to get back on the mats but hesitant to do anything that would jar my arm or shoulder. A couple of times I would fall on it and immediately get stressed and afraid that I might have hurt myself. The only way to get over the fear was to keep training, focus on my goals, and try to ignore the pain and stress. Coming back was hard because I had to retrain my body and instincts just to feel normal again. I felt hopeless and embarrassed several times, but I never wanted to quit. In the few months that I’ve been back I have won two competitions: the Chicago Winter Open and the New York Open. My teammates’ and coaches’ support are really what made those achievements possible. You are lucky to have a great female coach, Hannette Staack. What do you like about her and training at the school? I really am very lucky to be training with Hannette. She is a superstar women’s jiu-jitsu competitor, an amazing coach, a great person, and a good friend. The best part about Hannette’s coaching is that she knows how to teach each individual. She knows what I need to do to make my strengths their strongest and my weaknesses better. She always knows what to say and do to keep me motivated and confident. Each student is different and Hannette has the intuition to see exactly what we need. When I was injured, she was always there telling me that it was just a bump on the road, and I would be able to successfully compete again. Before the injury was healed, she would help me review what techniques that I could do and help me with my limitations. It’s the kind of thing that shows how much she cares about her students and I know she would do that for anyone in that situation. She and Professor Andre also promote a family and team environment where our goal is not only to get better but to see our teammates get better as well. I can’t say enough how lucky I am to have ended up with them! I plan to try and compete at least once a month or every other month this year. My biggest plan is 2013 IBJJF Worlds which is at the end of May. 8-time women’s Brazilian Jiu-Jitsu world champion, Hannette Staack and women’s jiu-jitsu lifestyle company, Fenom Kimonos, announced a collaboration Fenom Kimonos is calling a Pro-Partnership. Hannette began her jiu-jitsu training when she was 18 years old with Professor Fernando Cruz and Master Flavio Figueiredo, and eventually received her black belt from her current instructor, Andre “Negao” Terencio. Since then Hannette has fought every World Championship, taking several gold medals home and establishing herself as one of the most tenacious and talented female grapplers in the history of jiu-jitsu. She has an impressive record of never been submitted in any competition that she competed, since 1998. Hannette states that her greatest inspiration toward continuing her jiu-jitsu journey has come from Andre (who is now her husband), as he always inspired her to believe in jiu-jitsu. The two have realized a dream and are now reaping the fruits of their labor in their own academy in Chicago. The team is now gathering between Andre Negão, Hannette Staack, and Carlos Henrique (Andre’s professor) to form Brazil 021 School of Jiu-Jitsu. In the world of martial arts and combat sports, women have always been perceived and viewed to be weaker than men. After all, men are bigger, faster and stronger. That is until Brazilian jiu-jitsu was introduced to the mainstream. Never before has there been a style of fighting and self-defense that legitimately enables the physically smaller and weaker party to not only defend themselves but actually dominate and subdue the attacker. Brazilian Jiu-Jitsu has enabled women to level the playing field with men like no other martial art. Using scientific principles, techniques can be applied to engage and win. The effect of this phenomenon is profound and empowers women and girls of all ages. On and off the mat. It is on this foundation that Fenom Kimonos builds its message and mission. Ladies in Dallas and Houston had a chance to learn from Hannette Staack in 2012, now it’s San Antonio’s turn! Soul Fighters Texas gym is hosting Brazil-021 leaders Andre Terencio and Hannette Staack in February, the day after WPJJC trials. The BJJ power couple will teach a co-ed seminar and Hannette will continue her women only seminar series. Take advantage of the early bird price of $ 50.00, which is available until January 1st. After that the price goes up to $60.00 and if there is still room available, you may be able to sign up at the door for $70.00. Please contact Rebekah Duron at soulfighterstexas@gmail.com to sign up! Hannette Staack is returning to Texas on December 15-16, 2012 and this time she will be in Houston. She will be teaching a co-ed seminar with her coach and husband, Andre Terencio, on Saturday and women only seminar on Sunday. Houston area ladies, don’t miss this chance to learn from a multiple time world champion, fine tune your technique, and have your questions answered. It’s the perfect Christmas gift for someone who loves jiu-jitsu! Groundswell Grappling Concepts presents Women’s Grappling Camp at Fifty/50 Brazilian Jiu-Jitsu in Arlington, VA, over the Veteran’s Day weekend! The featured instructors are multiple time world champions Hannette Staack and Michelle Nicolini. There will be a total of 5 female black belts from 4 different countries represented at the camp. This is the first time WGC is bringing such a talented group of instructors from Brazil, USA, Canada and Japan together. Ladies have a chance to learn from Hannette Staack, Michelle Nicolini, Emily Kwok, Valerie Worthington, and Sayaka Shioda. All of the above-mentioned black belts are highly decorated competitors, respected instructors and dedicate a lot of their time to women’s jiu-jitsu by teaching women only classes, seminars and training camps. Camp is fully booked and registration is now closed, but there are still spots available for a co-ed seminar, conducted by Hannette and Michelle on Monday, November 12th, from 1-3 PM. More details about the camp can be found on WGC website and on the event FB page.